Dr. Bridget Barry grew up in a small city near Albany, graduated from Cornell in 1991, and has lived in Slaterville Springs on an old dairy farm ever since. Over the years she has worked at several small animal practices and currently works at Cornerstone Veterinary Hospital and Meadowridge Veterinary Clinic. Dr. Barry worked at the TCSPCA for 4 years, currently works several days a month at a cat rescue/sanctuary in Franklin, NY, and volunteers with several local cat rescue/foster groups. 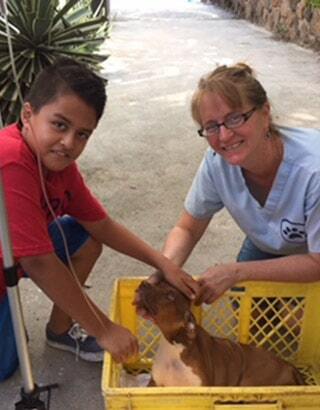 Every year, Bridget volunteers with a spay/neuter campaign and has been to the Bahamas and Peru to do surgery. She is a member of VMAT and NRVT (national veterinary emergency response teams) and spent time in New Orleans after Hurricane Katrina. A good chunk of Bridget’s spare time is spent taking care of her mostly rescued menagerie which includes dogs, cats, and iguana and tortoise, sheep, goats, alpacas, chickens, geese turkeys and a cow.